Provides a complete solution for bathroom vanities since its establishment in 2007, Design Element makes it easy for customers from ordering to installation. Available in multiple series and finishes, our varieties offer inspired styles from modern to traditional, that are sure to create that model home appeal. Design Element products are made using only the highest grade materials and by the hands of skilled master craftsmen. Design Element are available in an array of bathroom vanity set for complete look. 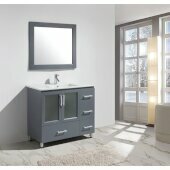 Most Design Element bathroom vanity sets includes: vanity base(s), countertops, sinks, pop-up drain and mirror(s). Find exclusive offers and free shipping on orders on Design Element Bathroom Vanity Sets when you shop at KitchenSource.com. Most of these linen and side cabinets are compatible with Design Element bathroom vanities to complete your bathroom theme. These linen and side cabinets from Design Element is ideal for storing your towels, bed sheets, tablecloths and other items.